18+ years of experience, providing excavation services from dirtwork to demolition. Iron Kross has more than 18 years of experience in residential and commercial excavation services. We are a fully licensed, bonded, and insured company, which specializes in providing complete excavation services, from dirtwork and demolition to sewer repair and water and sewer line replacement. We also offer 24/7 emergency services to homeowners and businesses in Tulsa and surrounding areas. We are professionals of the highest order and can handle any type of dirtwork, earthmoving, or excavation project. Our team consists of experienced, trained, and professional technicians who can handle all types of agricultural, residential, and commercial excavation projects. As industry experts in excavation and dirtwork projects, we can handle projects of all sizes easily. Whether you want landscaping, pond construction, backyard renovation, swimming pool excavation or grading, we can do it all. We have also handled large scale residential projects, which include preparing new home construction sites. We know how unsightly it can be to have heavy equipment, such as excavation rigs, bulldozers, loaders, and other machinery sitting around on your property. However, you don’t need to worry about it for long, since we will communicate with you throughout the project and ensure that it is completed on time to your satisfaction according to the highest standards. Apart from our expertise in residential excavation projects, we are also experts in commercial excavation and dirtwork projects. Our excavation technicians will handle project management, budgeting, and management, overseeing the entire project from start to finish. Our technicians will ensure that all commercial excavation projects are on track and will keep clients informed about the project status. Iron Kross Dirtwork Designs has built a reputable position in the commercial and residential excavation and dirtwork industry, so you can expect quality of the highest order from us. We work with cutting edge technology and state-of-the-art tools to ensure that all excavation projects are accomplished with minimal damage. 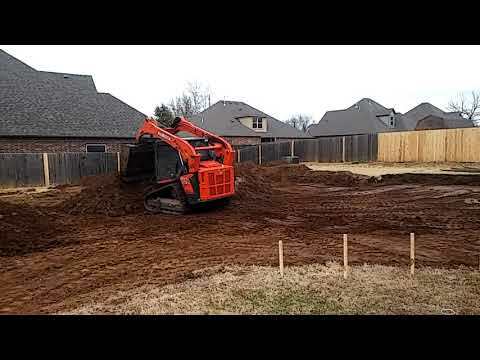 We are a full-service excavation company, offering a diverse range of services that will meet all your excavation needs in Tulsa and surrounding areas. Iron Kross Dirt Work Designs was founded by Shayne Lawson in 2013. We are a family owned business that strives to provide quality service at a fair price for all of our services we offer. Iron Kross services Tulsa, Oklahoma and the surrounding areas of central Oklahoma.